A significant development after the 14th general election (GE14) on May 9 was the turning of the tide in Malaysia vis-à-vis the 1Malaysia Development Bhd (1MDB) scandal. This made 2018 a year of two halves for the country. Before the vote, various probes had stalled and eventually hit a brick wall, even as other countries continued chasing the money trail and went as far as pressing charges of misconduct within their respective jurisdiction. In July 2015, the then prime minister Datuk Seri Najib Razak even sacked the then attorney-general Tan Sri Abdul Gani Patail on the day the latter was going to file charges against him. The new attorney-general he appointed, Tan Sri Mohamed Apandi Ali, cleared him of any wrongdoing in 2016. That disconnect between blatant cover-up at home and rigorous investigations abroad presented a bizarre contradiction that was among the major themes going into GE14. The stakes in GE14 were high: US officials reportedly preferred Malaysian prosecutors to charge any Malaysian official involved. The change of government saw Putrajaya revive the investigations that were stifled before the shocking fall of the Barisan Nasional regime, which had ruled uninterrupted for 61 years. In a clear statement of intent, Putrajaya also set up a special task force on 1MDB immediately after the polls. The focus? To claw back as much money and revenue from assets related to the 1MDB case as possible. The formation of an asset recovery team was followed in June by the appointment of veteran litigator Tommy Thomas, who has several landmark asset recovery cases under his belt, as the new attorney-general. The authorities, now fully unshackled, moved with spectacular pace and resolve, their sights clearly trained on the main actors in the scandal. One week after GE14, police raided Najib’s mansion in Jalan Langgak Duta, Kuala Lumpur. They also searched three apartments, believed to belong to his family members, in Bukit Bintang. With live media coverage going into the wee hours of the morning, Malaysians watched awestruck as scores of designer handbags, luxury watches and bespoke jewellery were carted away in hundreds of boxes. It proved to be “the biggest seizure in Malaysia’s history”, the police later said, with the total haul valued at about RM1 billion. The cash alone — RM116.7 million in 26 currencies — took 22 Bank Negara Malaysia officials three days to count using six counting machines. And on July 4, Najib became the first Malaysian prime minister to be charged in court. That was almost three years to the day when The Wall Street Journal reported how nearly US$700 million flowed from 1MDB into Najib’s bank accounts. The first set of charges comprised three counts of criminal breach of trust and one count of abuse of power relating to RM42 million received from former 1MDB subsidiary SRC International. 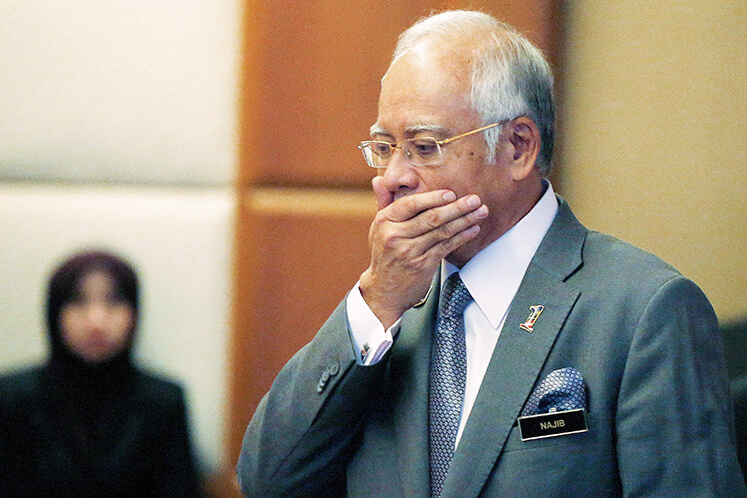 Three more charges against Najib over the same sum followed in August. In the same month, fugitive financier Low Taek Jho (or Jho Low), who had been at the centre of the scandal, was also charged in absentia alongside his father, Tan Sri Larry Low Hock Peng, with eight counts of money laundering of 1MDB funds. The charges against Jho Low followed a revelation by Prime Minister Tun Dr Mahathir Mohamad in June that he had tried to bargain for immunity against prosecution in exchange for cooperation. By Sept 20, the number of 1MDB-linked charges against Najib had swelled to 32. Najib has pleaded not guilty to all the charges, which he has decried as political prosecution. Two weeks later, his wife, Datin Seri Rosmah Mansor, was also slapped with 17 charges, including money laundering. While the charges unfolded against Najib and Jho Low, the asset recovery drive was initiated with the Malaysian government officially seizing Jho Low’s luxury superyacht, Equanimity — allegedly acquired with stolen 1MDB funds — in early August. Jho Low had slammed the seizure as illegal. In any case, the seizure resolved an awkward impasse as the Indonesian authorities had first seized the vessel on Feb 28 on behalf of the US Department of Justice, which asserted ownership on behalf of Malaysia. However, the Malaysian government at the time declined to claim ownership. Reportedly worth US$250 million, the 300ft superyacht was put on a month-long auction in late October with Burgess as the High Court-appointed broker. It attracted local and foreign bidders, reports said, at a US$1 million deposit per bid. approved the sale of the jet with proceeds to be held in escrow until legal rights are determined. In December, more people were charged locally following legal developments overseas. On Nov 1, a high-profile, three-count indictment was unsealed in a New York federal court that charged Jho Low and former Goldman Sachs bankers Tim Leissner and Roger Ng Chong Hwa with conspiring to launder billions embezzled from 1MDB. It is worth noting that Leissner — formerly the top Goldman Sachs executive in Malaysia (Ng was his deputy) — had pleaded guilty. On Nov 21, Goldman Sachs was also sued by International Petroleum Investment Company (IPIC), previously a partner of 1MDB. IPIC alleges that Goldman Sachs bribed its former officials reportedly involved in the 1MDB scandal, causing it “significant financial exposure and losses”. These formed the background to a statement by prime minister hopeful Datuk Seri Anwar Ibrahim in late November that Malaysia seeks to negotiate with Goldman Sachs for damages over its role in the scandal. However, he did note in an interview in Istanbul that a suit is also an option for Malaysia. That option proved to be the path eventually chosen. On Dec 4, five more money laundering charges were filed against Jho Low in absentia for sums of up to US$1.03 billion. Charges of money laundering and criminal breach of trust were also levelled in absentia against three former directors and officials of 1MDB — Terence Geh Cho Heng, former executive director of finance; Casey Tang Keng Chee, former executive director of business development; and Jasmine Loo Ai Swan, former general counsel. After it surfaced in late November that Najib’s government had tampered with the final audit report on 1MDB, he was charged with the offence on Dec 12 alongside former 1MDB president and CEO Arul Kanda Kandasamy, who was indicted with abetting Najib. Five days later, the Malaysian government also filed criminal charges against three subsidiaries of Goldman Sachs, possible the first such action against the investment bank anywhere in the world. The charges were over the subsidiaries’ handling of US$6.5 billion in bonds issued by 1MDB. Attorney-General Thomas said the investment bank had broken laws “at the heart of the capital markets”. Ng, the former Goldman Sachs investment banker, was also charged on Dec 19 with abetting the bank by misinformation. As the year draws to an end, the prosecution list is clearly far from complete. Among others, the asset recovery team was reported to be investigating the RM974 million channelled from Najib’s accounts to various individuals and groups between 2011 and 2014. And this may only be the tip of the iceberg: The US Department of Justice has said it is looking at as much as US$4.5 billion allegedly misappropriated from 1MDB. Therefore, more charges could surface in 2019. In addition, several key players remain at large — such as Jho Low and his lieutenants at 1MDB. As the investigations and legal actions run their course, expect more developments in 2019.